AustinMoonwalks provides party rental delivery services to the greater Austin Texas area and communities like Round Rock, Pflugerville, Georgetown, Cedar Park, Leander, Westlake and Hutto. If your specific location is not listed, please contact us at (512) 585-5867 and we will be happy to assist you with specific delivery information for your party or event address. Delivery Fee Applies for some areas. This represents a partial list of postal codes for our delivery area and does not encompass all the communities we serve. 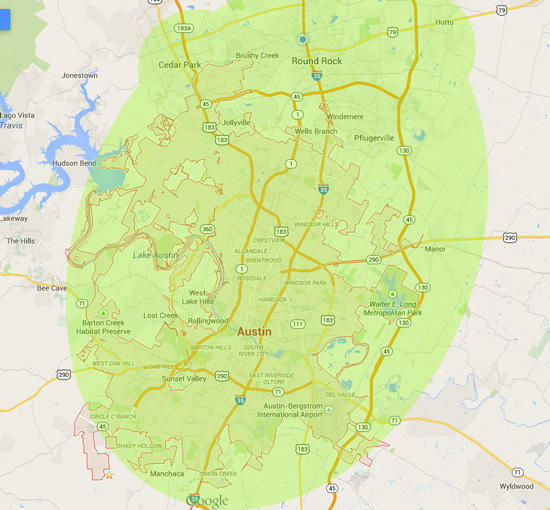 If your specific zipcode is not listed, please contact us at (512) 585-5867 and we will be happy to assist you with specific delivery information for your party address.